PC Games > Strategy Games > Farm Frenzy Inc. 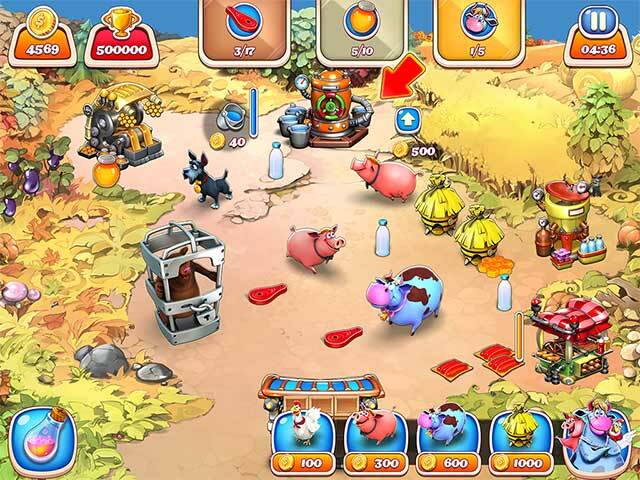 This version of Farm Frenzy has a record number of levels. We hope you will enjoy it! Farm Frenzy Inc. is rated 3.1 out of 5 by 14. Rated 5 out of 5 by naynayjordan from Another Great addition to the series!!! I LOVE these games! I have bought every one and love playing them. They are also helping my kids learn hand eye coordination when they play too!!! Rated 5 out of 5 by pennmom36 from I've Worked Myself Into A Frenzy Over This Crazy Fun F2P Game! 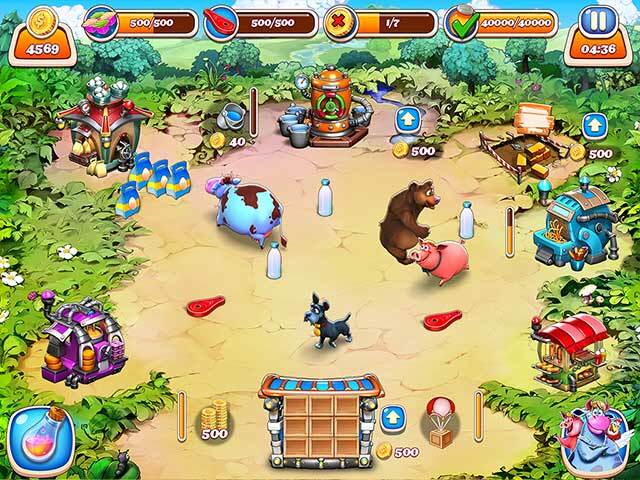 Farm Frenzy is one of the most entertaining Time Management games available. Big Fish has done an excellent job transforming this popular series into a Free To Play game. The tutorial is excellent, and takes you step by step through the game, explaining how to play as well as how to navigate through all of the features, starting with your very first chicken! This Time Management game gives you specific goals, requiring you to purchase farm animals such as chickens, pigs and cows. All animals need food, so you click on the ground to plant grass in several areas so the animals can graze, in return the animals will give you a product. The main feature in this game however is the chicken. The chicken lay eggs for you to collect, clicking on the egg will send it to the warehouse, and according to the goal requirements, you can either load the delivery truck to sell them at the market, or send the egg to the Powder Plant to make powdered eggs. The powdered egg packages can be sold or sent to the Pasta Plant to make pasta and then the Lasagna Plant to make lasagna. Ferrets and even Bears will show up occasionally, and you need to quickly click on them several times to build a cage around them before they steal you resources. The good news is that you can sell these pesky critters by sending them to the truck. You will earn a Gold Star when you complete the level within the time limit (if you fail to meet the requirements in time, you can replay the level but it will cost you one life) You can also go back and replay other levels if you need more coins or gems. Most levels can be replayed three times, each time you replay a level, the goals are slightly different. It took me a while to figure out why there were slots for 3 stars, but I kept earning only one, so don't forget to return to the previous levels to earn all available stars. You can purchase upgrades to increase production of the plants product, as well as upgrades on a larger warehouse, and a larger truck or helicopter, with keys and gems you earn throughout the game. You can earn 21 different Awards which gives you gems that can be used to purchase bonuses, but you have to click on the awards icon and accept the award first. As you progress, the boosters and upgrades will require more gems, and those gems are scarce, which means that eventually you will have to either be patient and wait to earn them, or "pay" real money to purchase them from the in game store. Enjoy! 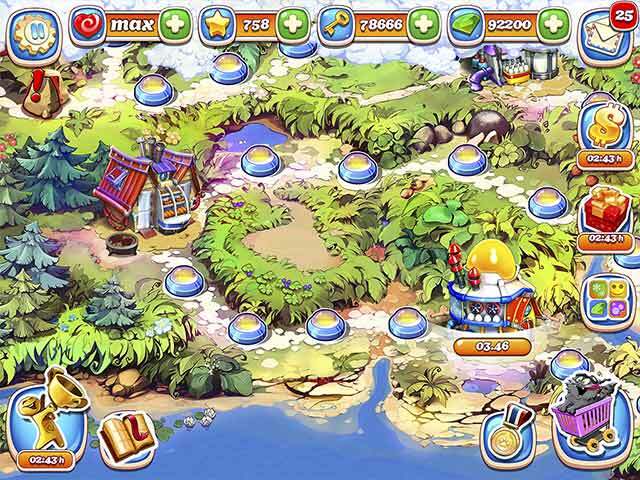 Rated 5 out of 5 by jvt702 from Farm Frenzy Inc. Fun! Fun! Fun! Lots of great levels! Rated 4 out of 5 by JessalynGunn from Another great addition! This game is great fun and a great time-killer. This isn't the best in the series, but it's definitely worth the purchase. Rated 3 out of 5 by gshaske from It's OK.. but not as fun I agree with other reviews that the amount of clicking around in this version becomes tiresome. That being said, it has much of the fun when you are playing the levels, just the between levels that is annoying. 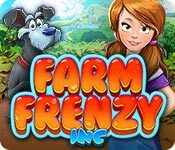 Rated 3 out of 5 by Trixietrx from Too little for too much I love Farm Frenzy games, and love that this has a new twist of time limits. However, I pay a lot to get a game each month, and there are very few games like this so I find it highly upsetting that I cannot seem to use my credits to get upgrades in this game. Free to play is always a joke, and I did end up getting bored because I LIKE the old way of being able to upgrade cages and storage, etc. based on my gameplay. Now it's just clicking all over the place, and trying to figure out how to get through the levels without some pop up telling me to purchase items, or trying to fit things into unmanageable sheds and trucks. I think the tutorial was actually a hindrance. I clicked on items I did not want to use at the time because the tutorial told me to do so. So when I need them, I don't have my bonuses available anymore. I don't understand these tournaments, either. So I've wasted a lot of "free" resources and find that frustrating. Rated 2 out of 5 by NonyaBznoch from Thinly veiled pay app The game wasn't very exciting. Within the first few minutes it was already showing pop ups advertising in app purchases to speed the game up. It is a pretty standard issue strategy/management game that isn't worth spending any money on. Rated 2 out of 5 by Blue4dogs from In game purchases = DO NOT BUY!!! Started game, I've played other Farm Frenzy game but none made me feel absolutely stupid. Maybe if you're 5-6 you will appreciate the tutorial but not me. Then come to find out they expect people to spend their cash for game tokens. Oh no, I'll buy a game but learned spending $ for in game purchases is easy until you realize you have just wasted your hard earned money & got nothing for it. Have done it before & learned the hard way how stupid that is. I don't mind replaying games for tokens to buy stuff but the failure of the tutorial on how to play the game & the store asking for cash to buy tokens to proceed further totally killed my interest. Deleted game after playing only 7 levels. Not going to waste my time on this failure! Rated 2 out of 5 by sharee100 from What?! Where do I buy upgrades? What are the keys for? Don't like the sound effects for catching the bears. The goals are not in the same old place. Color contrasts are low. it's difficult to tell if I got a silver button or haven't played the level yet. Why isn't the level finished when you have collected the items on the list? Exciting adventures in the unique world of Farm Frenzy!